A friendly reminder that the supplementary regulations for the first race of the series are available within the Club Racing section of the blog. 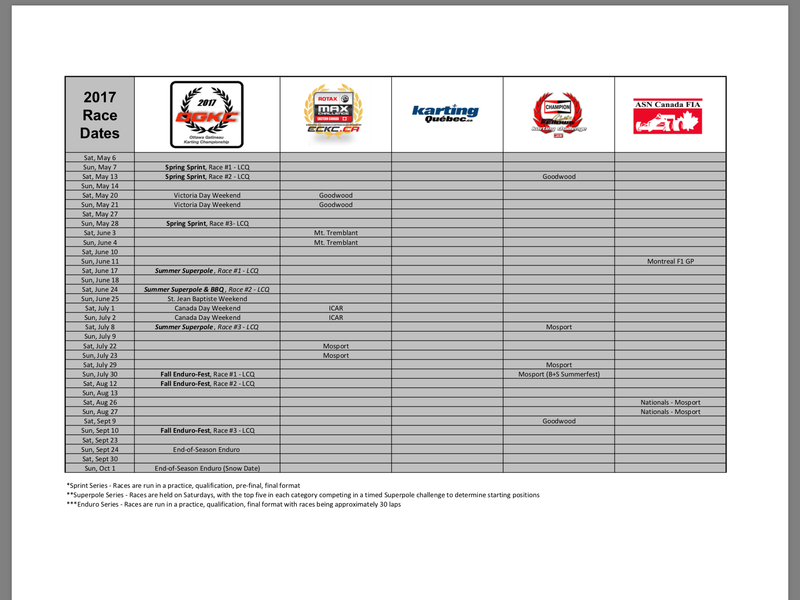 The regulations, as well as other documents such as race-day technical forms, track waivers, parental consent, medical form, etc. can all be found at one convenient location. Don’t forget to bring your applicable forms to the track with you! Online registration will remain open until Saturday, May 2nd at 9pm. You can still register at the track; however, you will no longer be able to benefit from the special online rate, which is a $10 savings from the regular rate. Please visit the registration section of the site for membership and registration information! 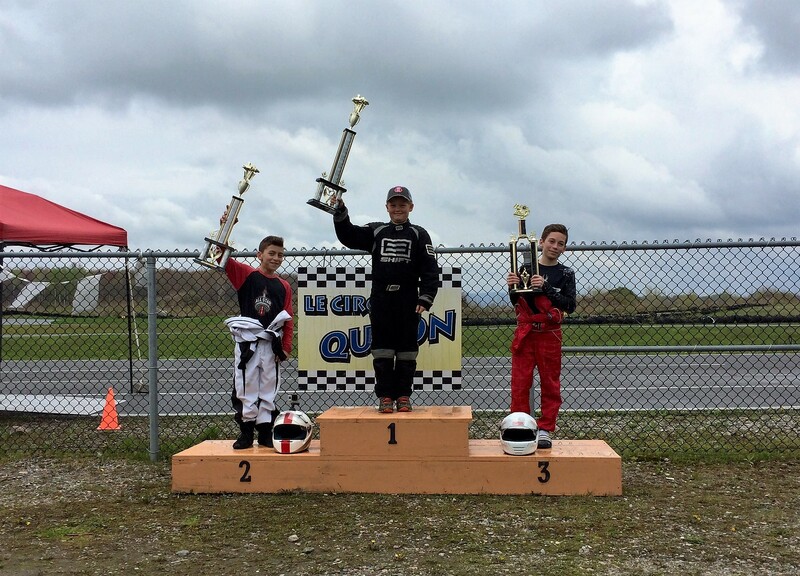 (Mont-Tremblant, QC) The Margay/Le Circuit Quyon Racing Team had mixed results at this year’s Canadian National Karting Championships, recently held at Le Circuit Mont-Tremblant in Quebec. 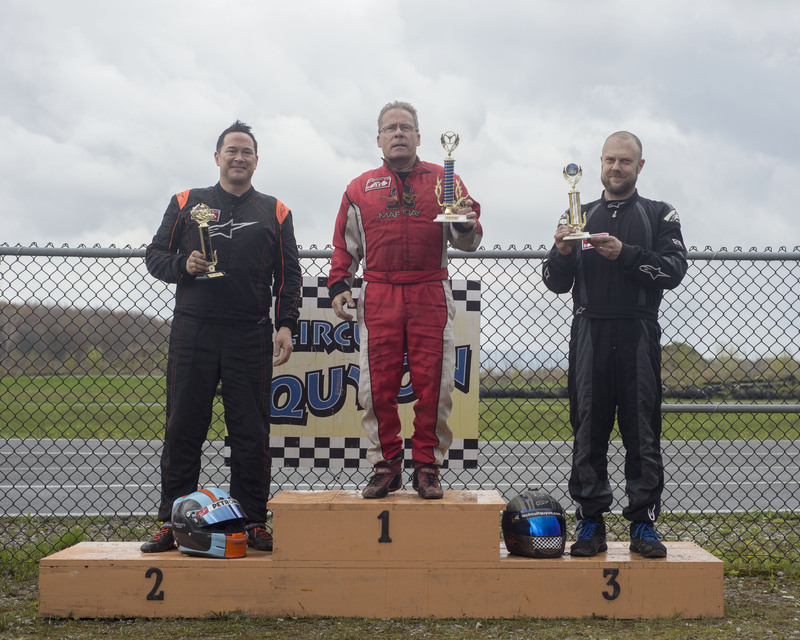 It was blue skies and warm conditions for the majority of the four-day event, and the track was raced for the first time in a counter-clockwise direction to spice things up. 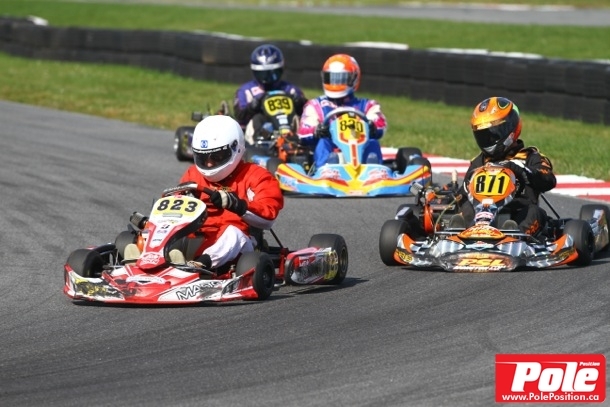 The race team was composed of Briggs & Stratton Junior racer Paul Hoffman (655), Briggs & Stratton Senior racer Charlotte Lalonde (717), and Briggs & Stratton Masters racers Mike Forget (882), James Dunn (823), Darren Mallette (898), and Crawford Kilpatrick (805). 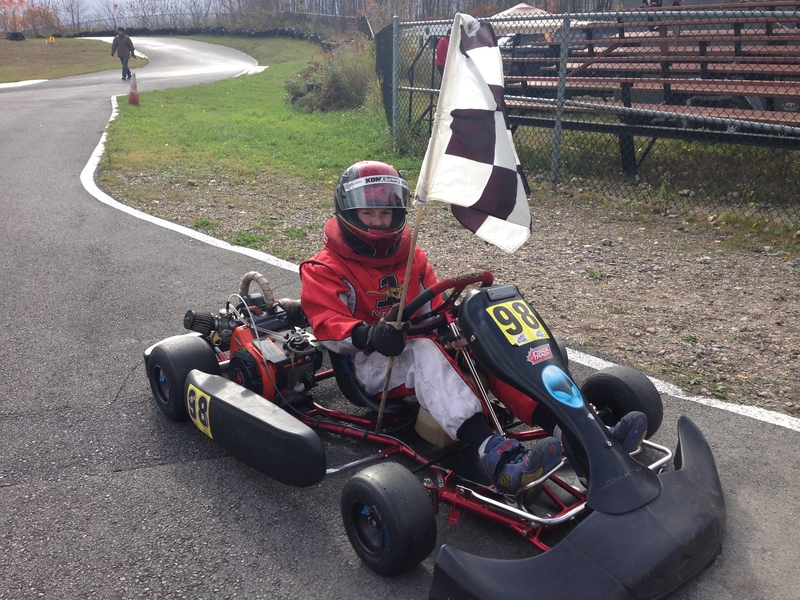 This was Paul Hoffman’s first national karting event, and he showed great progress over the course of the weekend! 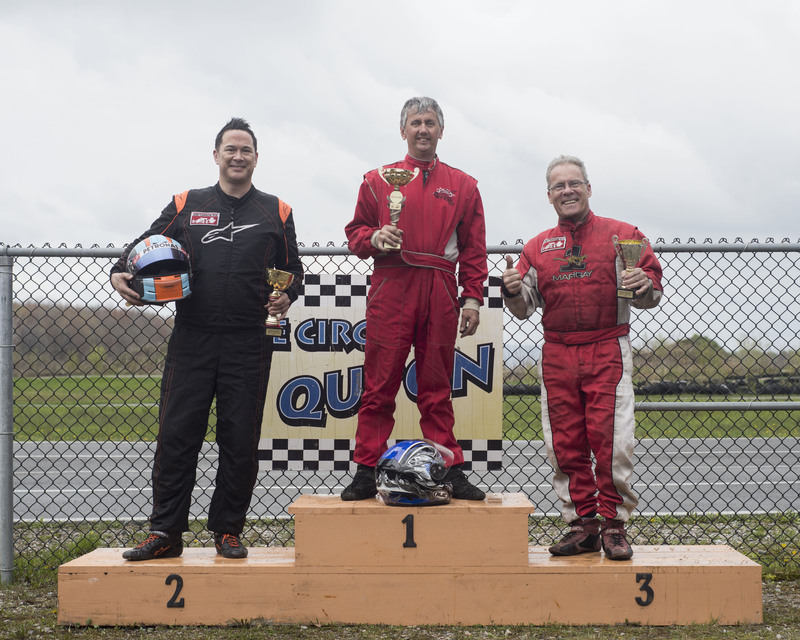 During the final race, Paul showed great race-craft by mixing it up with several other competitors in close pack racing, and made up several positions over the course of the race. 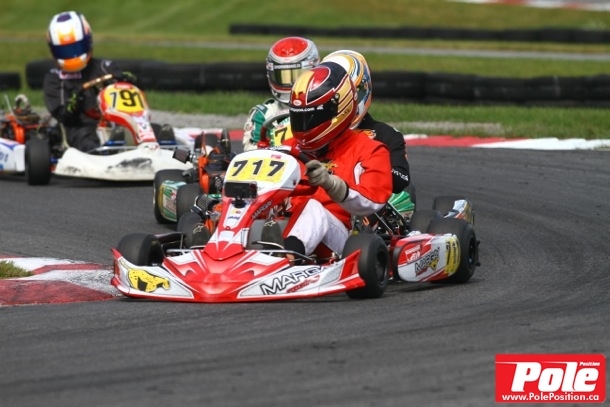 Unfortunately, with only a few laps remaining, he was struck from behind by a fellow competitor and had to retire due to kart damage. However, it must be said that Paul improved session after session and showed amazing progress throughout the weekend! We are sure that he’ll just get better and better – and we wonder where he’ll finish in next year’s championships! 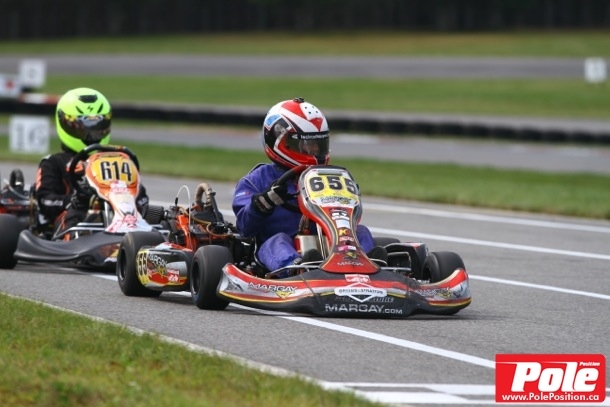 Charlotte Lalonde had a very strong weekend, with her positions in qualifying and heat races always in the top ten! 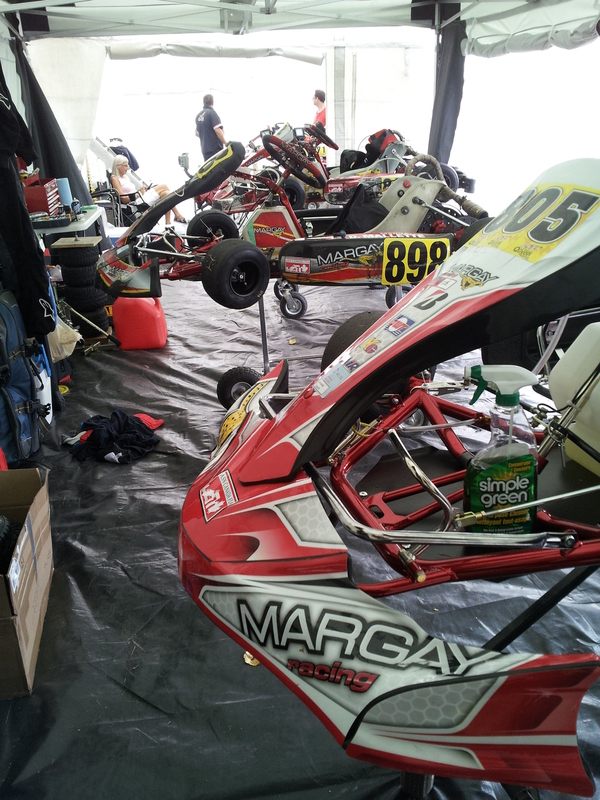 Come race day, Charlotte started the final in 8th position and had a very competitive race! Charlotte was always in the leading pack, and made her way into the top five prior to dropping back and finishing the race in a strong 8th place. 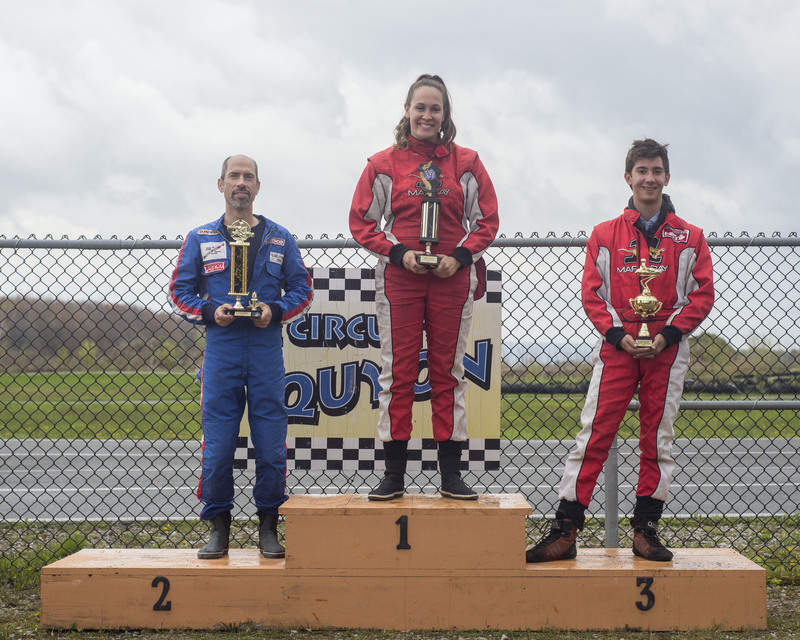 She had excellent lap times, with her fastest lap in the final coming on lap 12, less than three-tenths of a second off the fastest overall lap of the race. 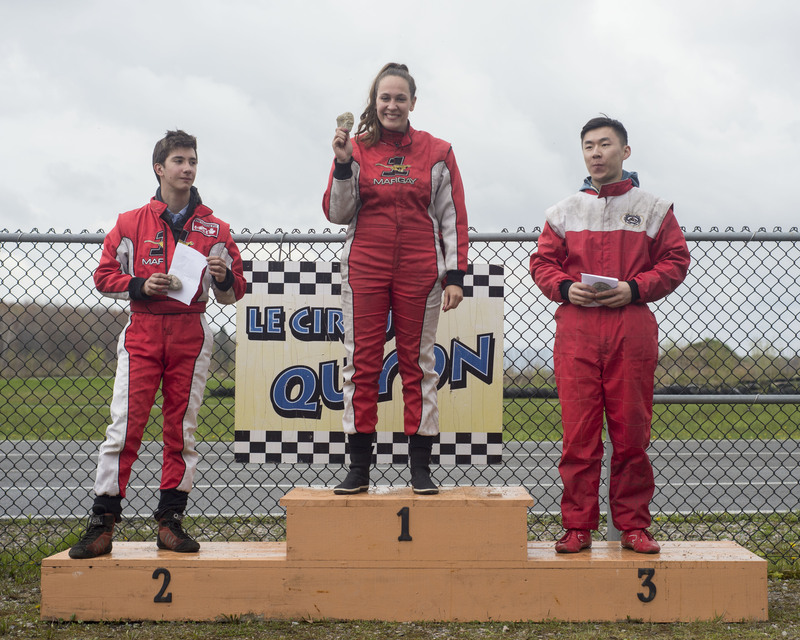 Charlotte had a very promising weekend, and things are looking good for the Coupe de Quebec race to be held in Tremblant in only a few weeks time. 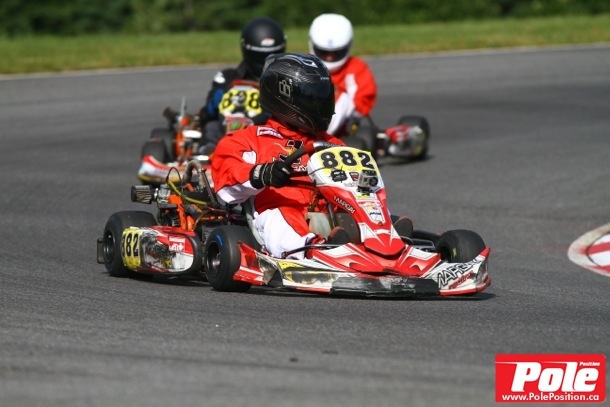 Look for Charlotte to rock the track upon her return to Tremblant! 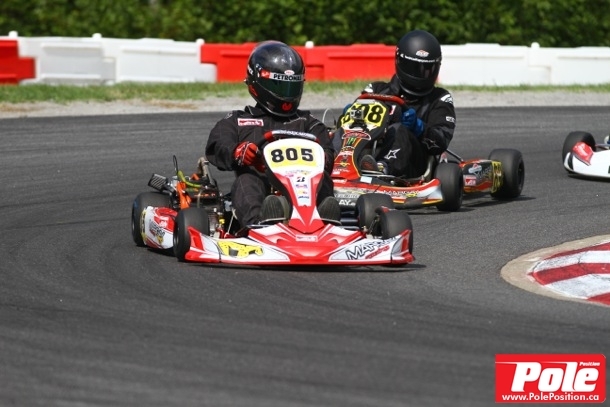 In the Briggs & Stratton Masters Class, Mike Forget and James Dunn both had excellent times and were consistently in the top 10-15 racers in a 30-racer field. Darren Mallette and Crawford Kilpatrick were a little further back, routinely finishing in the high teens and low twenties for the majority of the weekend. In the final, Mike and James had strong starts; however, Mike was unable to complete the race after a spin off the track at the end of the long back straight. James managed to keep it on the track, racing a very hard and aggressive race to finish 11th against some of the top racers in the country. Darren had a competitive race, climbing up to 16th by the chequered flag. Crawford, although climbing up the order to 17th and holding station behind Darren, eventually dropped back into a pack of several racers and finished his day in 21st. It was a mixed event for the Masters crew – but they’ll be back next year to chase after better results! 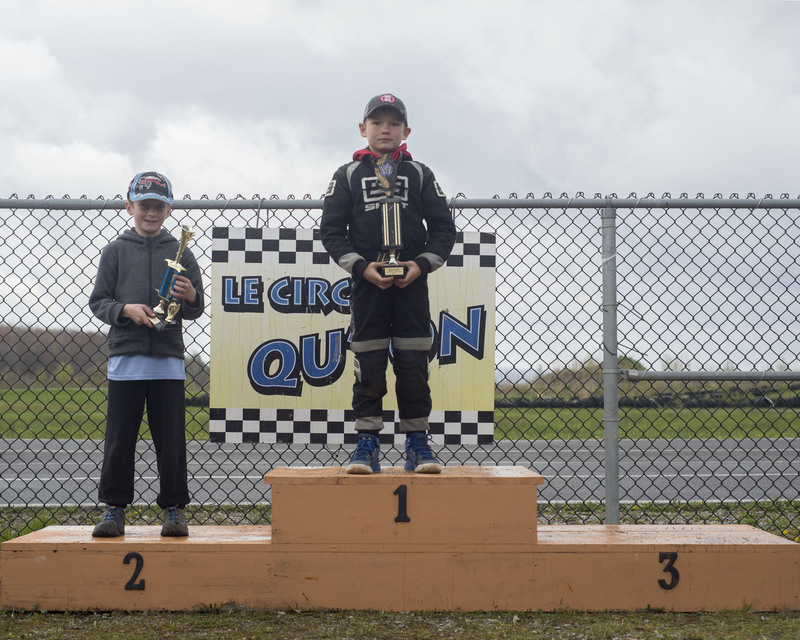 Congratulations to all of the members of the Margay/Le Circuit Quyon Racing Team on a great weekend! It may not have ended with podium finishes and victories; however, the team had a great time, had fun, worked together, and will be much better prepared for next year’s campaign! 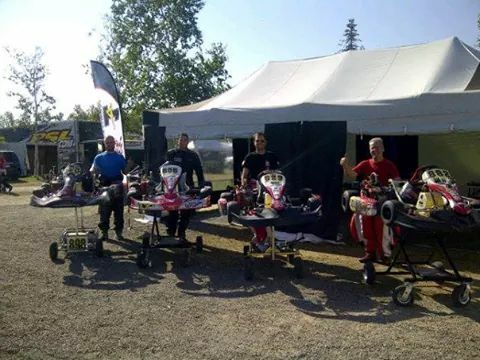 Thanks to Le Circuit Mont-Tremblant, l’Académie de karting Jim Russell, Canadian Karting News, PolePosition.ca, and all of the teams and sponsors for making the 2014 championships an amazing success!